I did this last season and quite like the idea, so I’ll throw it up again for this time around. An explanation of total shots ratio can be found here and here, for PDO see here and here. Spurs were good (high) and unlucky (left). This translated into a decent amount of points (solid sized bubble) and a positive goal difference (lightish green). United were less good (lower) and luckier (further right). They scored more points (bigger bubble), and had a higher positive goal difference (much lighter green). At the end of last season I said “Liverpool couldn’t buy a goal this year (darker green). If I’m a manager looking for a new post this is the perfect time to take over at Liverpool, they’re almost guaranteed to score more points next time around, even if they aren’t as good.” Well they weren’t as dominant were just as good (edit: h/t Will TGM) with the ball this time around but scored more points. I also said “If there’s one thing this plot shows us it’s that (with the possible exception of the Manchester teams) there is literally no correlation between TSR and PDO.” Well City regressed all the way to the mean this time around, and there’s still no real pattern here. 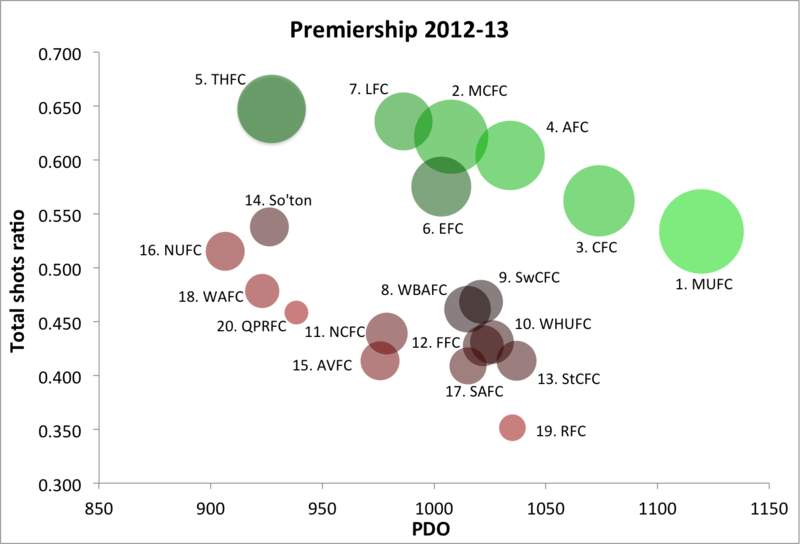 Once more the top seven teams formed almost their own tier, but Southampton were excellent too. They’re a team to watch the next time around if they keep all of their players – it’s pretty unlikely that they’ll record a sub 930 PDO next time around. Reading deservedly were relegated, and it’s somewhat just that Newcastle didn’t go down, they had an horrendous amount of bad luck. The rest were kind of a mess – we’d have had some knowledge about which teams were more likely than others to be relegated at the start of the season but at the end of the day it’s largely a PDO driven coin flip. Looking at this, if I were an unemployed manager right now I’d have my fingers crossed that an opportunity arose at Newcastle, and I’d be steering as far clear from Stoke as possible. Some in this thread are claiming that PDO is a primarily luck-driven statistic. Others are claiming that some teams will have significantly better PDO numbers than others over the long run. These statements are not necessarily incompatible. Both can be true, depending on the context. With respect to the first statement, it is true that, at the level of a single NHL regular season, most of the variation between teams is luck. This can be measured with some precision – if we look at each season from 2003-04 to 2010-11, for example, we find that 61% of the team variation in PDO was due to luck, and 39% due to skill. This carries implications for estimating a team’s true talent level with respect to PDO. For example, during the above noted period, if we single out the teams with the best PDO number in the league in each of the seven seasons, they posted an average mark of 1.025. Because most of the league-wide variation is due to luck, however, our best estimate is that a team with a 1.025 PDO number actually has a true talent PDO number of only 1.00975. This corresponds well with the observed data – the teams in the above study posted an average PDO number of 1.0083 in the following season. Of course, merely because most of seasonal variation in PDO is due to the luck isn’t to say that all teams have the same underlying talent with respect to PDO. The skill standard deviation at the team level is about 0.0074. So if the team with the best underlying PDO talent in the league is two standard deviations above the mean, it would have a true talent PDO number of 1.0148. That’s a sizable advantage. The problem is that because most the variation over a single season is due to luck, that team’s observed results will vary significantly around that mean. The Bruins had an average PDO number of 1.011 in each season from 2007-08 to 2010-11, but the range over that period was considerable (0.991 – 1.029).